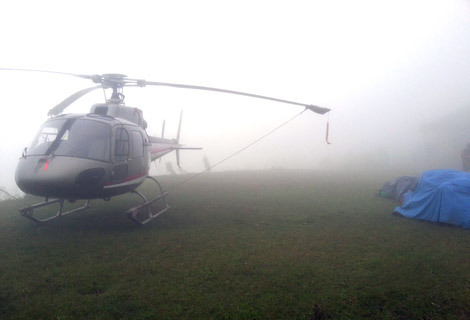 Miles of smiles to the team ‘Alpenglow Expeditions’ – Summit Helicopters Pvt. Ltd. Season for mountain climbing! Movement for alpinists has started here in the heart of capital now. Team of Alpenglow Expeditions lead by the famous alpinist Mr. Adrian Ballanger headed for attempting Mt. Makalu. 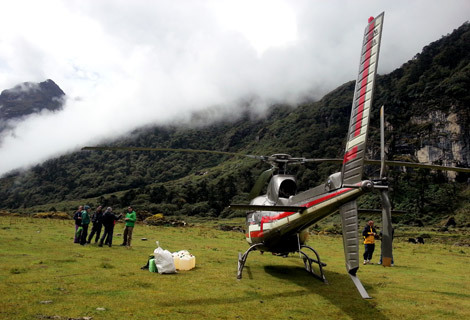 On 13th of September, team of seven members and one Sherpa were picked up from Tumlingtar and were dropped off to Makalu Base Camp by Fishtail Air Helicopter 9N-AKA. Captain Asish Serchan was the pilot in command accompanied by Engineer Mr. Anil Basnyat. Posted in: Company News, Special Mission, Tourism News.